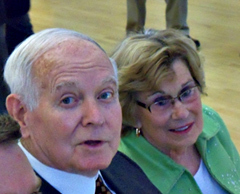 Former Governor Bob Ray and his wife Billie in 2013. Governor Ray died on Sunday at the age of 89. His funeral will be at 1 p.m. Friday at First Christian Church in Des Moines. It’s the same church where he met his wife and high school sweetheart, Billie. The church is across the street from Drake University, where Ray earned two degrees and later in life served as interim president. On Thursday evening, Governor Ray will lie in state in the Iowa capitol building. Iowa National Guard soldiers, Iowa State Troopers and Des Moines Police will carry Governor Ray’s casket into the statehouse. From 5:30 until 8:30 p.m., Iowans will be able to pay their respects by passing by Ray’s casket in the first floor rotunda. Due to security checkpoints at the statehouse, officials advise those who wish to do so to arrive early, before 4 p.m. Governor Ray’s funeral on Friday afternoon will be livestreamed. More details will be announced later today. The family did announce yesterday that memorials may be directed to the Robert D. and Billie Ray Center at Drake University, 2507 University Avenue, Des Moines, IA 50311 or https://alumni.drake.edu/RayCenterSupport.